Backup Exchange 2010 to save your business messages from any troubles expected and unexpected, such as re-installing your Windows Server from scratch. Handy Backup will help you backing up Exchange 2010 database with the MS Exchange plug-in. To instruct Windows to backup Exchange Server 2010 on a regular basis, you can schedule backup task, with an exact time to run and an exact period of repeating, which varies in length from a minute to some months. Additionally, you may run your Exchange 2010 backup task by system event (e.g., logon). Ensure that your Windows Server 2012 backup Exchange 2010 data to some secured place, such as to an SFTP/FTPS server or an Amazon S3 bucket, by using an encrypted transferring protocol! Another possibility is to use the internal encryption by BlowFish, either standalone or along with compression. 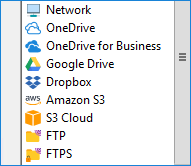 Besides the protected storages mentioned above, you can backup Exchange Server 2010 messages to many other places, including local and network disks, external USB drives, NAS and FTP servers, as well as to clouds (example, backup to Google Drive, Dropbox, OneDrive, OneDrive for Business). This powerful solution for a single machine allows your Windows Server backup Exchange 2010 data automatically, quickly and without a trouble – just out of the box! 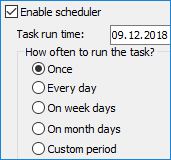 Run Handy Backup and create a new task. 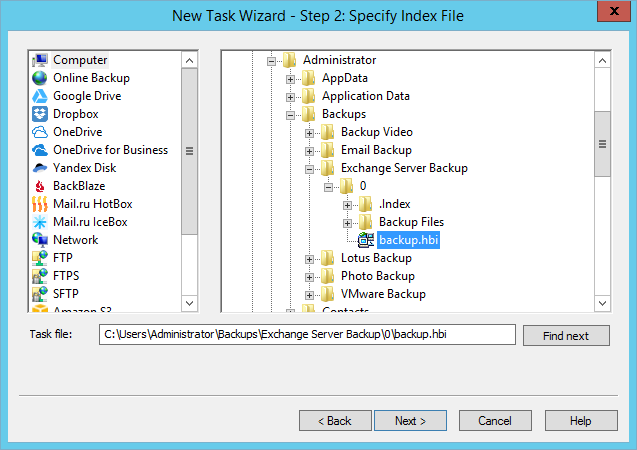 On the Step 1, select the backup task type and then click "Next". On the Step 2, expand the "Email" group on the left panel and choose MS Exchange plug-in. Double-click on the MS Exchange or click the ">>" button. You will see the plug-in data selection dialog. For backing up Exchange Server 2010 database, mark the checkboxes against the names of databases associated with particular accounts and mailboxes. 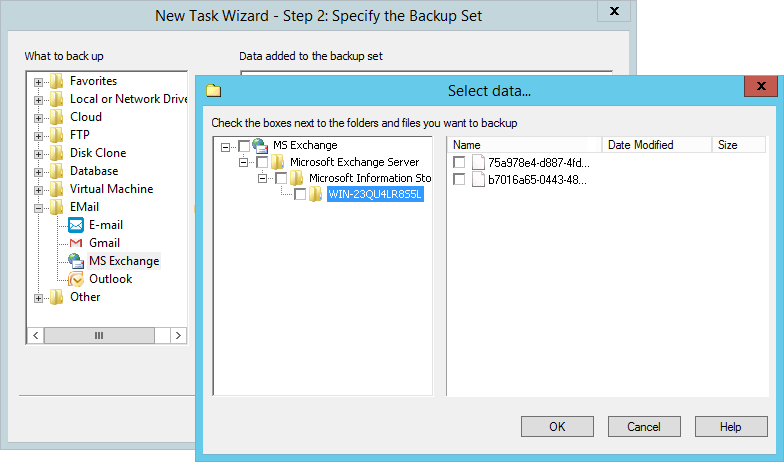 After selecting all data to backup Exchange 2010, click OK to return to the Step 2. Continue creating a task according to the User Manual. These steps are not specific for backing up Exchange 2010. You may want to create an auto recovery task when you need to make Exchange 2010 restore mailbox from backup. This is as simple as backup task. Create a restoration task by making a new task and selecting data recovery type on the Step 1. On the Step 2, select your backup storage and search for a file called backup.hbi, which contains your Exchange Server 2010 backup data. Select this file and click "Next". Continue creating a recovery task as described in the User Manual. Caveat! On current versions of Handy Backup, you cannot restore your Exchange 2010 backup database to some other location. 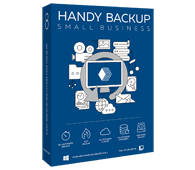 Experience how easy is to backup Exchange 2010 with Handy Backup! Try it just now by downloading the latest version with all plug-ins for the 30-day free trial period!